And then all of a sudden – Miss Moppet jumps upon the Mouse! 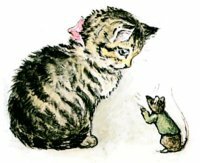 And because the Mouse has teased Miss Moppet – Miss Moppet thinks she will tease the Mouse; which is not at all nice of Miss Moppet. But she forgot about that hole in the duster; and when she untied it – there was no Mouse! Frederick Warne ? Co., Inc. (1906).